The Swedish EBM act Pouppée Fabrikk reunites after 7 years of (almost) total absence from the scene. The news has been announced on the band’s myspace site. Frontman Henrik Bjoerkk returns on vocals and Christiaan R. (C.A.P./Menticide) joins the band as full member, filling the place of former member Jouni Ollila. The PF studio has also been rebuilt to its former strength and work is currently in progress on the new album, scheduled for release in 2010. 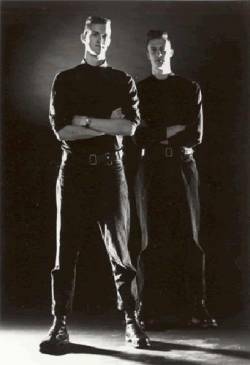 Pouppée Fabrikk is a Swedish EBM band, started in 1988 by Henrik Bjoerkk and Leif Holm, who both hail from Karlskoga. Initially, the music of Pouppée Fabrikk (PF) borrowed heavily from minimalistic electronic acts such as Deutsch Amerikanische Freundschaft and , but with the addition of Jouni Olilla and Jonas Aneheim on guitar PF moved towards a more Die Krupps-style electronic/metal mix. The “Your Pain – Our Gain” CD was meant to be released in 1996, but due to differences in opinion between the band and the record company (Energy Rekords) it was delayed until 1999. In 1996 the band decided to take a break and PF was put on hold and the band members worked on various solo projects. In 2000 the band re-united for a gig at the Tinnitus Electronic Festival and announced that they were planning a comeback and returning to their roots. They released a four track mini CD entitled “Elite Electronics” but there was no trace of an album. A year later both Jarmo and Henrik left the band to concentrate on their respective solo careers. PF disbanded shortly afterwards, but re-appeared again in the autumn of 2005 at a concert at Beatclub in Dessau, Germany with Johan Damm from Volt as the new vocalist.